When I heard about the first ever National Tabby Day, I knew I had to participate. A few years ago, I wrote a post called The Glorious Tabby Cat. That post continues to be my most popular post of all time so I know there are lots of people out there who love tabby cats. As you probably know, tabby cats are not a breed. Tabby is a coat pattern and comes in several variations. Tabbies originated from the African wild cat which has similar markings that are excellent camouflage. 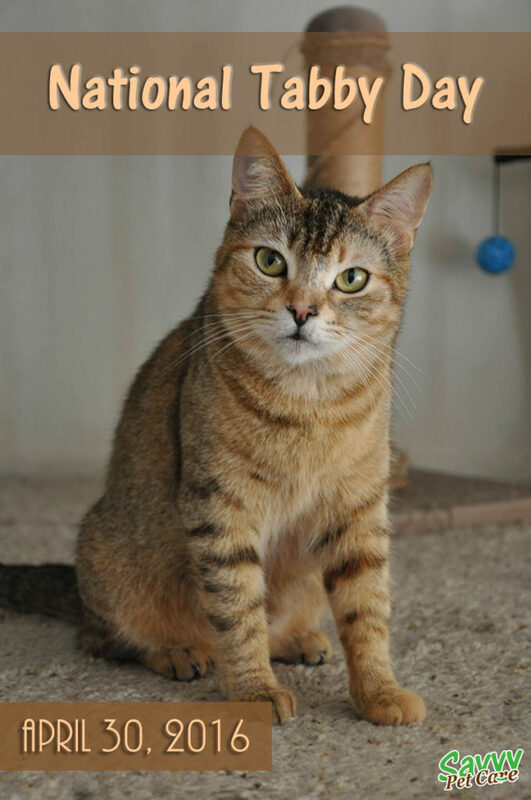 You can read the above post to learn more about tabby patterns, personality and myths. Famous tabbies include Morris the Cat, spokescat for 9Lives; Garfield; Lil Bub; and Thomas O’ Malley, the tabby in the Disney movie The Aristocats. Maybe Buffy the Cat will join this list! April 30th this year has been designated to celebrate these much-loved cats. The event was motivated by the release of the book Making the Most of all Nine Lives: The Extraordinary Life of Buffy the Cat . Buffy, of course, is a tabby cat. 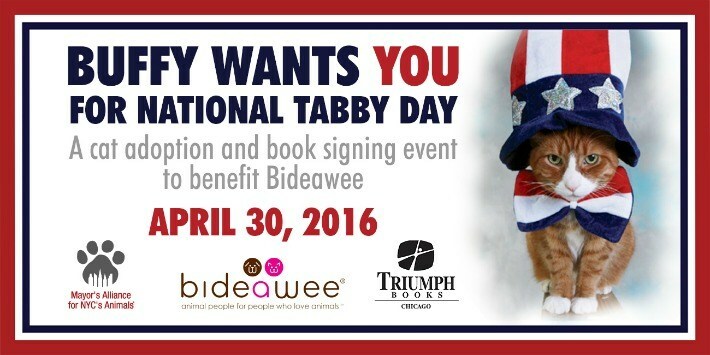 The Mayor’s Alliance for NYC’s Animals, Bideawee, and Triumph Books will celebrate the day with a cat adoption event and book signing by author, Sandy Robins, at Bideawee Animal Shelter in Manhattan. Today is also National Adopt a Shelter Pet Day so it is a perfect day for the festivities. I hope they have a very successful event and lots of kitties find their forever homes. Do you have a tabby cat? I have one tabby and two others with some tabby markings. Will you be celebrating National Tabby Day? I’d love to hear from you in the comments. We celebrated by sharing ALL our Lost, Found & Adoptable Tabby Cats across all our social media networks. I love the way you profiled the ginger tabbies… & a tuxie tabby! Tabby cats are awesome! I had no idea that a special day had been set aside to celebrate them. Thanks for sharing! We looked like gray tabbies the first week of our lives. Tabby cats are great. We love our Sassy girl! Tabbies definitely deserve to be celebrated – they are beautiful cats! This is the first year! Wonderful new annual event. Happy (belated) National Tabby Cat Day! To be perfectly honest, I didn’t know what a tabby cat was before this post. Thanks! I SO wish I could have attended that book signing in NY, especially since it benefits Bideawee. Not only did I get my first dog from Bideawee but my dog and I are a Therapy Dog team, volunteering through Bideawee. I live in Phoenix most of the year but spend several months a year in NY – we are moving back there soon. I’ve always loved Tabby’s, their markings are so gorgeous! My last Tabby was a beautiful boy I adopted and named Mousey, because he was so shy. I miss him terribly. Carmine is an orange tabby kitty. Lita has tabby stripes on her legs, and Jewel had some tabby markings, too. I hope that lots of kitties found great homes for Tabby Day!! I have always loved tabby cats! So beautiful! Happy National Tabby Day! I had a tabby named Miss Gitty that I rescued. She lived to be 20+ years old. Her character in my book series is the wise mentor. ♥ Tabbies ROCK! I had a tabby rescue. I would definitely go and support Sandy and National Tabby Day of I was in NYC. Hope it is a big success and lots find homes. Soo cute! Happy Tabby Cat Day!! I love that they’ve made a tabby day! I do have a tabby in our household. And I recently read that torties can be tabbies too! If that’s true, I think our tortie is a good candidate for that. So that would be we have two tabbies! No Tabby cats here but I love their markings. I hope the event is successful! What a fun day!!! Yay for Tabby cats! Never knew there was a National Tabby Cat Day! Thanks!! !